We’ve made some updates to help you maintain clean data in your account. Also, a couple updates to help with groups and associated individuals. And finally, some minor commission updates to help track bill from dates. Here’s what's been released in February. If you work with groups, a key aspect is tracking and working with individuals connected to groups. You’ve said we could do a couple things to make this easier. With that in mind, here are a few updates to help with this. You can now customize the columns in the Group - Individuals tab to see additional details to get more info at a glance. Additionally, you can now associate existing individuals to the group in this area. Also, we’ve updated the export function so you can access additional details. All this to make sure you can get to the details you need. 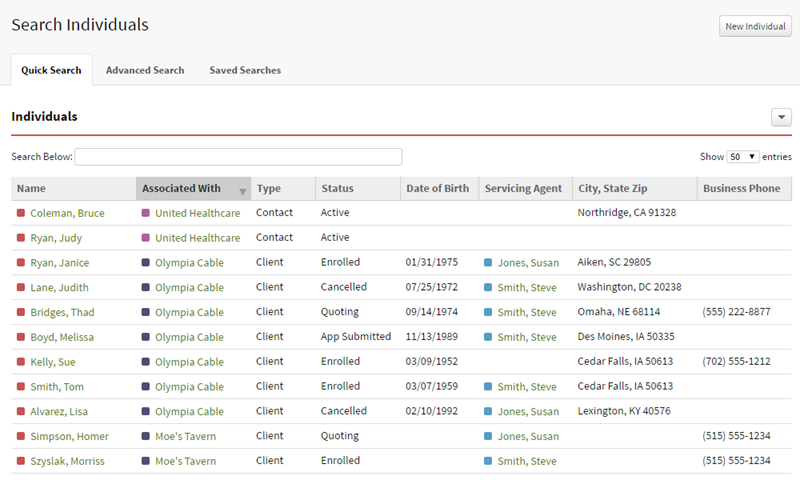 In the individuals area, you can now add a column to show which carrier or group an individual is associated with. You can search by group or carrier associated with and sort this column. Additionally, in advanced search, you can now add criteria to limit search results based on an association with a group or carrier. See more in Working with Column Settings help article. Maintaining clean and accurate data is important to help you be more effective and efficient in your work. Clean data ensures accurate reporting and that you can quickly find the correct information. You've said we could help with this by creating a way to merge duplicate records. 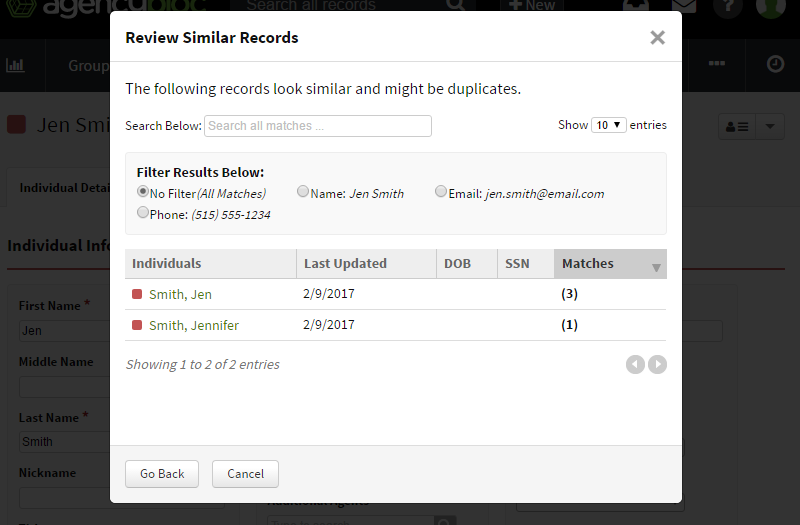 Now, you can catch duplicates before they are created and merge duplicate individual records in your account. The saying goes, an ounce of prevention is worth a pound of cure. This is true when it comes to detecting and preventing duplicate records from sneaking into your account. Duplicate data can create headaches when it comes to finding the right information. 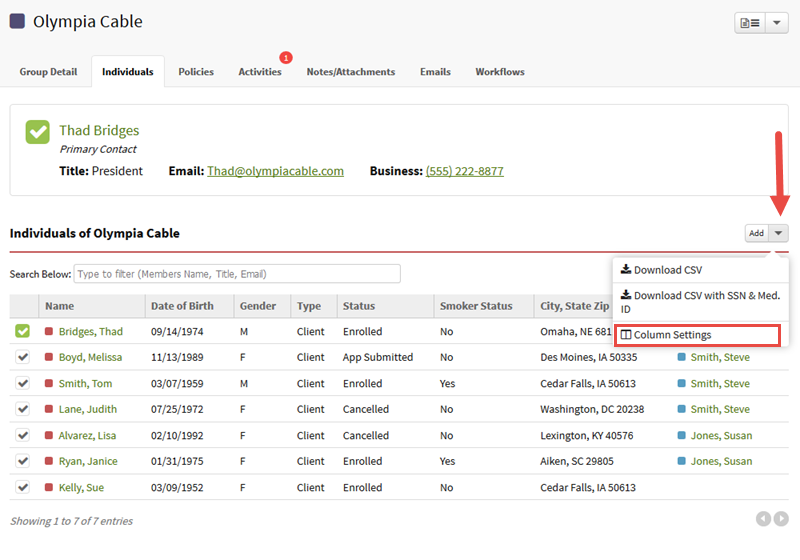 To help prevent and find duplicates, AgencyBloc detects duplicate individuals when you create a new individual and while you are viewing a record. See more in the Duplicate Detection help article. Over time, it’s possible to end up with several instances of the same individual in your account. Duplicates in your account can make it difficult to find what you need and can skew reporting. You can merge duplicate contacts to keep and maintain clean data in your account. 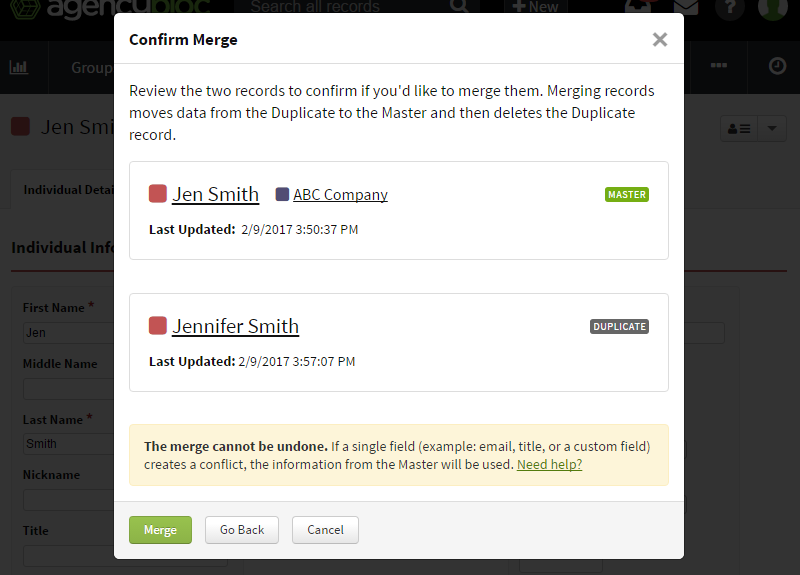 Merging takes data from the duplicate record and moves it to master, then deletes the duplicate record. The master is the ‘winner’ of the merge and is kept in your account. Merges cannot be undone. See more in the help article on Merging Duplicate Individuals. If you've worked with commissions in AgencyBloc for any amount of time, you'll soon recognize the importance of bill from dates on commission entries. In AgencyBloc, the bill from date indicates the payment date form the carrier. 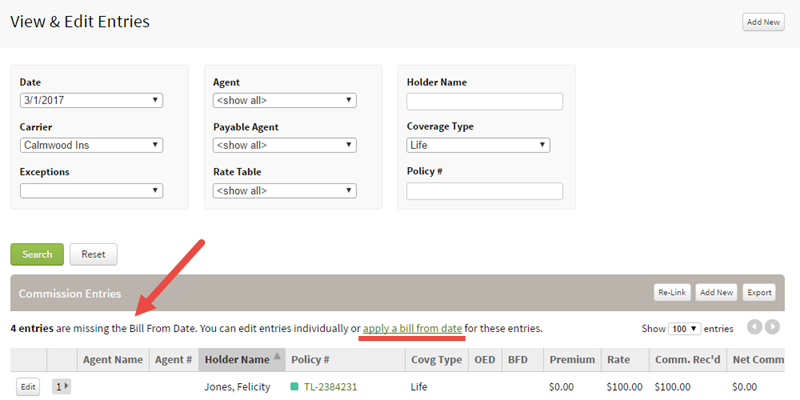 Simply put, bill from dates help you keep track of when a payment is made to your agency on a policy from a carrier. Keeping track of this date can help you find missed payments and track payments over time. With this in mind, we made a few small updates to help you keep track of bill from dates. After you import entries, you see a summary of the import. In that summary, we added a line item to include the number of entries missing bill from dates. 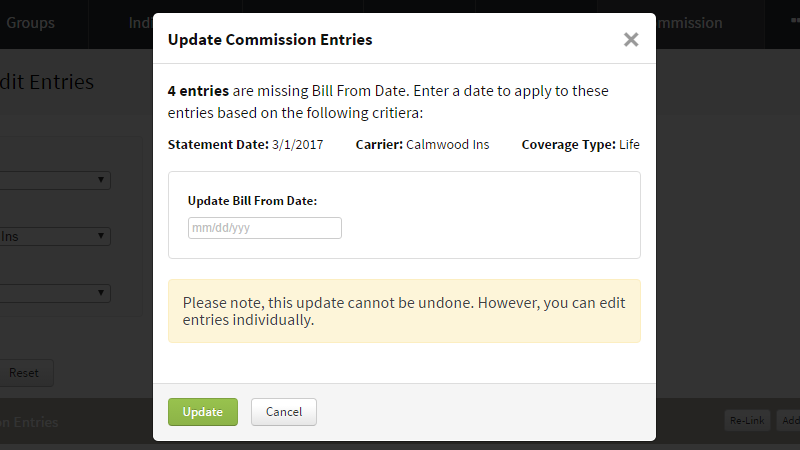 When you are viewing or editing commission entries, you'll see a message letting you know how many entries are missing bill from dates. Additionally, you can now apply a bill from date to these entries. The date is applied to commission entries based on the filters you set when viewing entries. So, if you need to apply a bill from date to a specific set of commissions, use the filters to limit your search and then apply a date. We added a few notes when viewing commissions on a policy. So, when you review missing payments or last 12 months actual, you'll know how it's impacted by bill from dates. Please let us know what you think. If you need anything, please let us know - we're here to help.